Five small bites of pizza crust. 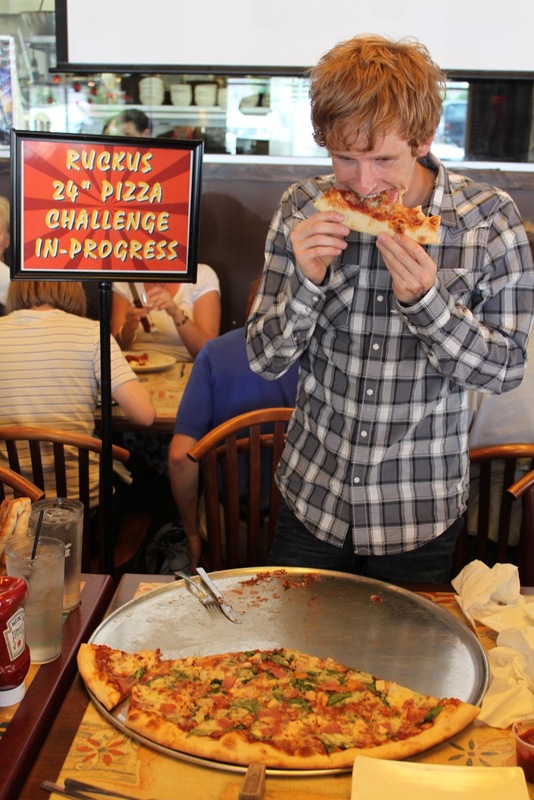 That’s all that stands between my Swedish friend Gustaf Lunnergard and the Ruckus Pizza Challenge Wall of Fame. The challenge entails consuming a colossal 24-inch pizza with two veggie and two meat toppings in one hour or less. More than 130 have attempted it; only four have prevailed. Nearly 20 friends and colleagues gather to watch and support Gustaf. He chooses his toppings wisely: spinach, basil, Canadian bacon and chicken. The challenge begins at 1:06 p.m. on Thursday. A lean runner with the metabolism of an Olympian, I presume Gustaf has a better chance than most of slaying the challenge. I have also seen him consume massive amounts of food in short amounts of time. Did I mention that Gustaf might weigh 135 pounds soaking wet? “I’m really hungry!” Gustaf pronounces. Just then, the pizza arrives. “Are you kidding me? He has to eat that whole thing?” one friend asks when seeing the enormous size of the pizza. Ten minutes into it, Gustaf has tossed down nearly three pieces of the eight placed before him. “You’ve got this!” one friend says confidently. I nod in agreement. At 1:21 p.m., he tears into his fifth piece, on pace to shatter the existing record of devouring a behemoth pie in only 31 minutes. Gustaf is in the zone, slowing down just long enough to wipe his mouth with a napkin and elicit an occasional belch. At 1:35 p.m., however, just after polishing off six and a half pieces of pizza, Gustaf utters these troubling words: “I’m feeling pretty full.” A brief look of doubt comes across his face. Gustaf takes the next 15 minutes to rest. According to Ruckus managing partner Ryan Pilz, no one has ever completed the Ruckus Challenge in more than 40 minutes. In other words, speed is of the essence. Gustaf is in danger. He has 16 minutes left to finish the last one and a half pieces. “I have no more room in my stomach,” Gustaf admits. He stands. He paces back and forth. He unbuttons his pants. Nothing seems to help. Somehow, though, with just six minutes left, Gustaf finds another gear. He manages to choke down another piece, leaving him just half a piece to go. He breaks the remaining partial slice into six smaller pieces. He hoists one bite of crust to his mouth and chews. Suddenly, Gustaf’s face is awash with terror. He nearly vomits. Gustaf then races to the restroom, disqualifying himself from completing the challenge. It is the closest near-completion in the history of the Ruckus Pizza Challenge. Gustaf gave it his best effort. “I want to try again someday,” he told me Friday, just moments before catching a plane back to Sweden. Here’s hoping he will get another opportunity. Next time I’m confident he’ll be victorious. Within collectors' hublot replica a few earlier Submariner versions tend to be referred to as "James Provides. " As well as permanently cause: within the very first 4 Wayne Relationship movies, Broker 007 depended upon tag heuer replica uk, because he or she do within the books through Ian Fleming. The actual wrist watches lose interest the actual cartier replica amounts 6200, 6538 as well as 5510. Through the period this hit the industry, the actual Submariner experienced handed thorough area fake rolex sale. The actual Start with regard to Heavy Ocean Investigation within Cannes released a study upon March. twenty six, 1953, about the 5 rolex replica sale weeks associated with assessments this experienced carried out using the view, comprising 132 delves within absolute depths associated with 12 in order to tag heuer replica sale yards. The actual declaration in the lab study the following: "Despite the actual very higher sodium content material from the Mediterranean sea seas, and also the exotic heat as well as moisture in order to that the view had been subjected between your person delves, this demonstrated absolutely no deterioration whatsoever.